Myrtle Beach real estate is all about "location," and there's hardly a better location than that of the Ocean Forest Plaza. 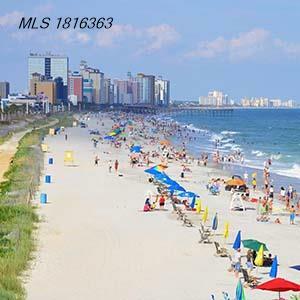 These Myrtle Beach condos are situated on a unique piece of property in the Cabana Section of the north end of Myrtle Beach. The convenient location makes this property easily accessible to all area entertainment, dining, shopping and nightlife. Featuring oceanfront views from large private balconies, the Ocean Forest Plaza offers spacious one-bedroom, one-bath condo units with fully-equipped kitchens with dining areas and large living rooms. And, Ocean Forest Plaza is among a select number of oceanfront condos that offer an unbeatable combination of location, curb appeal and affordability. Whether you're looking at purchasing a second home for a vacation getaway or a solid oceanfront real estate investment, Ocean Forest Plaza is worth a look. Welcome to the official CENTURY 21 Strand Group website for Ocean Forest Plaza condominium sales.